“March comes in like a lion, and goes out like a lamb”. This old proverb refers to March’s famously changeable weather. As a month where we transition from winter to spring, March can often start off cold and blustery, but end warm and calm. From the beginning to the end of the month, average daily temperatures typically increase by 10°F. Exact conditions, of course, vary from year to year. Although the precise origins of this popular phrase are unknown, many believe it is based on the constellations. At the beginning of March, Leo (lion) is prominent in the night sky, while Aries (sheep) begins to rise toward the end of the month. Spring Chill for Much of the U.S.
We are one week into the new spring season and winter-like conditions are lingering across much of the United States. With the polar jet stream plunging down from Canada, cold air continues to blast a large portion of this country. Unseasonably cool temperatures have even been reported as far south as Florida. These widespread chilly conditions, in turn, are supporting an extensive national snow cover. According to NOAA, 48.7% of the continental U.S. is currently under a blanket of snow. That is the largest area of coverage – for this point in the season – in ten years. 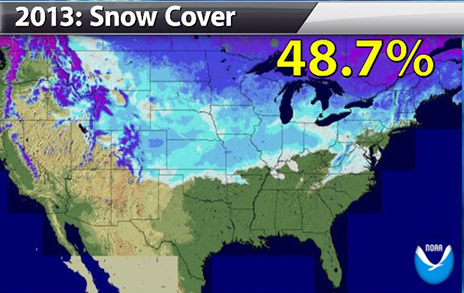 National Snow Cover on 3-25-2013. Today is the Vernal Equinox, the first day of spring in the northern hemisphere. The new astronomical season officially began at 11:02 UTC, which is 7:02 A.M. Eastern Daylight Time. Seasons are the result of the tilt of the Earth’s axis, a 23.5° angle. Today, as spring begins, the Earth’s axis is tilted neither toward nor away from the sun. As a result, we receive approximately equal hours of day and night. 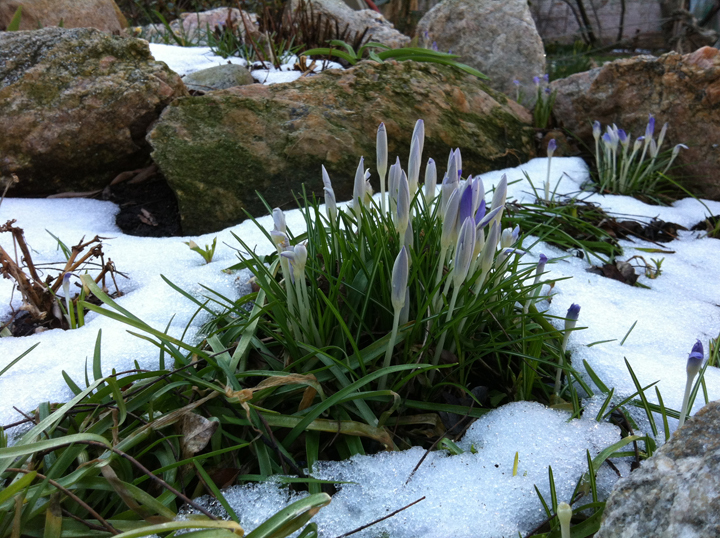 The spring equinox usually marks the end of winter’s chill and the gradual return of warmth. This year, however, many people across the U.S. are experiencing conditions that feel more like the Dead of Winter. These unseasonably cool temperatures are expected to remain in place for the near future as the polar jet stream continues to dip south over a large portion of the country. The 20th Warmest Winter in the U.S. The winter of 2012-13, in many parts of the United States, feels like it will never end. Storm after storm has been rolling across the country producing a profusion of significant snow events. All told, however, this meteorological winter (December-February) was actually warmer than average. According to NOAA’s National Climatic Data Center, this winter season was the 20th warmest winter on record for the contiguous U.S. Posting an average temperature of 34.3°F, the country as a whole was 1.9°F above its long-term norm. For comparison, last winter (2011-12) was the nation’s fourth warmest. It is interesting to note that eleven of the past fourteen winters in this country have been warmer than average. A plethora of winter storms have rolled across the continental U.S. this season, often producing impressive snow events. Long-term drought, nonetheless, continues to plague many parts of the country. According to the latest report from the US Drought Monitor, 51% of this nation is in some form of drought. While this number represents improvement for some areas, such as the southeast and mid-west, it is still bad news overall. The heart of the drought remains in the High Plains, this nation’s agricultural breadbasket. Conditions of moderate drought or worse cover 91% of the region with 24% suffering under exceptional drought, the worst possible category. Experts say the High Plains require significant precipitation – at least 12 inches of rain or its snow equivalent – to quench the worst drought the area has seen in more than fifty years. A winter storm lingered over much of the northeast late last week. In New York City, it deposited 4 inches of dense, wet snow in Central Park. In the storm’s wake, however, Spring-like conditions swept across the area. The city reached a high temperature of 55°F on Saturday and saw all of the recent snowfall melt away. Only two days earlier, we had a high of 38°F. Our normal high for this time of year is 47°F. As pleasant as this spring preview has been for many winter-weary New Yorkers, forecasters expect to see cool conditions return by the end of the week. A significant winter storm is expected to slam the northeastern United States tomorrow. The type of snow it produces will depend on the temperature profile of the atmosphere. Air temperatures hovering near the freezing point produce large, partially melted snowflakes – wet snow. This type of snow is very dense and good for making snow-people. However, it is very heavy and difficult to shovel. Dry snow, on the other hand, is more powdery and does not pack as well. It falls as numerous small flakes when the air temperature is below 28°F. In terms of snow to liquid equivalency, the general rule of thumb is ten inches of snow melts into one inch of liquid water. This ratio, however, tends to vary widely with different types of snow. For example, it can take as much as fifteen inches of dry, fluffy snow to yield one inch of liquid water, while only five inches of wet snow can do the same.